"...I left Cape Girardeau six days ago - worse than that - I left there on the 29th of August, and came out ten miles to this pretty little secession town and here we remain till some of our officers get their troubles settled. We came here to fight the enemy - 4 companies of the 20th, 6 companies of the 8th Mo. and 3 of the 9th with 2 pieces of artillery and 80 cavalry, came out here to fight as much enemy as we could find but the tramping of Prentiss on the west, and the stir of preparation at the Cape frightened all the armed secesh into swamps toward the Arkansaw line, and we found no enemy. We arrived here at 3 o'clock on Friday morning the chickens were crowing gaily - alas, there are but few left to crow now! A net of guards were set about the town but they caught no big fish. We found it a town of women and children - the women went into conniptions a little, at first but they now seem to enjoy the novelty of a Union camp quite well. The men still remain absent, occasionally we bring one in. On Sunday morning last Gen. Prentiss came in with his brigade from Ironton & Pilot Knob, the brigade is here yet. As I sit in the parlor chamber of Gen. Watkins' deserted house tonight, the camp of Prentiss Brigade looks like a field of lanterns, or an illuminated city seen in miniature. The Brigade is composed of the 7th 17th 19th and 24th Regts. of Illinois, and the 2d & 7th Iowa, 300 cavalry, and some ten or a dozen pieces of artillery. Capt. Buell's Battery. The detachments of the 8th and 9th Mo. that came with us have now returned to the Cape. The 20th Regt. forms a camp by itself, and several Brigadier Generals are in a row about which shall have command of it. Prentiss wants it - Grant wants it - and the people of Cape Girardeau are begging Fremont to march the Zouaves out of Camp Fremont and bring the 20th back again. We are the good steady boys that dont steal honey and chickens and they all want us. We are popular with the secessionists on that score. I am in Genl Watkins house - have been making out Muster rolls for Co. F. We have had plenty of music here till last night. Col. Cook of the 7th gave the piano to Mrs Watkins niece. Almost everything conveniently portable and of value has been carried away - much of it fairly stolen; the room that I am in is still in good order except the bed, nothing is left of that except the bedstand - all the furniture in this room is heavy carved rosewood and the sofa, chairs bureau are superb to say the least. I am writing in a fifty dollar chair and writing on a marble topped center table, but the mirror on the bureau opposite reflects rather a rough looking soldier and it occurred to me that I am - "putting on some chunks", and as "taps" are beating, I will halt this letter here, go down to quarters and roll me in my blanket. Sept. 6th. There is a tonic in the air this morning: if we can have a few more such mornings in succession it will brace up the back bones of our debilitated soldiers - there is not much sickness among them, but the men are not so robust as they were in the spring. I believe I stand the draw as well as any of them. I have enjoyed as good health this summer as I ever did, and am well now. I have found no acquaintances in this brigade - the Princeton boys here are all well. Oscar Gamble has been quite sick but is now on duty again. We took him away from the Hospital physicians and he soon got well - our worden doctors are not good for much. 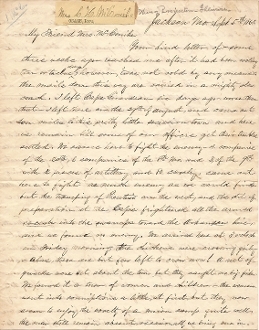 Eight of our men have gone home on sick furlough,; three or four are in the hospital, a dozen, or so, are on extra duty, the second Lieutenant commands the company, and, all things considered, Co. F is in rather bad circumstance at present, But I believe the way ahead is clear, and that Company F will be all right again in a short time. Col. Marsh and several Captains are under a cloud. The Captains will come out all right, but I fear, I hope, rather, that Col. Marsh will have to walk the plank..."
Some fold split, otherwise fine and legible.